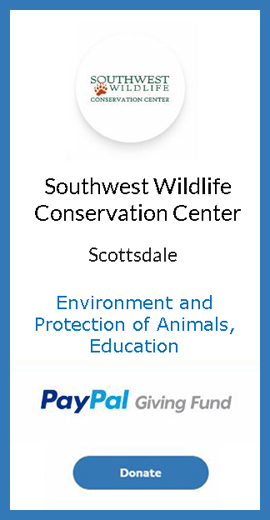 Southwest Wildlife Conservation Center (SWCC) is enrolled in the PayPal Giving Fund. Donate to SWCC through PayPal Giving Fund! PayPal Giving Fund does not charge us fees for their services, so more of your donation benefits the animals we care for. PayPal Giving Fund’s mission is to support charities by connecting them to more potential supporters – without charging donors or charities for the PayPal Giving Fund services. Learn more about PayPal Giving Fund. Southwest Wildlife Conservation Center (SWCC) is a non-profit organization that has rescued and rehabilitated thousands of wild animals over the past twenty years. We provide a home-for-life in our accredited sanctuary for animals that cannot be released. Our doors are always open to wildlife in need, 365 days a year. We simply could not do this without your support. 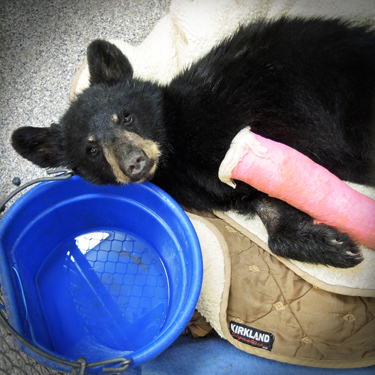 Help save a wild life by making a donation today. Thank you! Making this a monthly payment will make you part of our Wild Family! Read all about it and schedule that donation here!